The Bitter, Ignominious End of Divestraps.com? – I Already Have a Watch. The Bitter, Ignominious End of Divestraps.com? About a year ago there was a minor fracas on the net surrounding the claims and activities of Duncan McMorrin, owner of Divestraps.com who also traded and posted under the name “Outstretchedhands” in watch collector communities. The allegations against McMorrin were almost too bizarre to be believed. Criticisms included everything from attacks on McMorrin’s claims about the supposed Kevlar® content of his straps to admissions that at least some of the custom colors offered had been achieved using felt pens to color white stitching. Further allegations surfaced about a spurious charitable website McMorrin formerly ran at Aviationmission.org and previous shady dealings in the Minox camera collecting community dating back as early as 2002. All the while McMorrin cited his supposed piety and “charitable” work and continued. For reasons that perplex me, Duncan McMorrin and Divestraps continued successfully selling straps through his website even after the problems were exposed. Some seemed content to buy into the “premium” (overpriced) marketing but the problem not longer merely a question of cost comparison. The most recent and pertinent development seems to indicate that recent customers paid the exaggerated price but received nothing at all. A quick survey of some internet forums shows posters who sent payment as early as September 2009 but still have not received anything. It seems that people all over the web have been stiffed since about September of 2009, sending payment for straps that never arrived. At first there were excuses given, then inquiries were ignored, and now would-be customers attempting to complete the checkout on the divestraps.com website are thankfully unable to complete the transaction and are served instead with this error notice from PayPal. Of course there are many reasons a user could receive this error, but among them are that the account has been suspended following user complaints. And of course, the accounts of reputable merchants in good standing seldom to never encounter this particular difficulty with their PayPal accounts. And as the number of complaints seems to grow daily, it seems increasingly likely that the account was suspended following customer complaints. 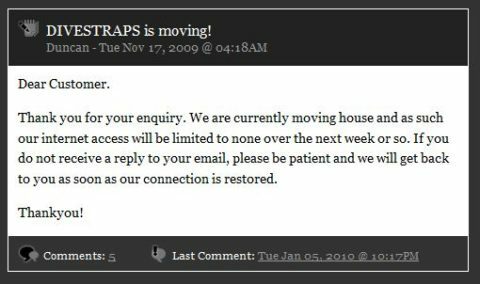 Divestraps.com "Moving" excuse for lack of responses. It would almost be interesting to see what retorts McMorrin might comes back with this time, except at this point I expect the community is bored with his self-promoting protestations and excuses. I know I am. Good riddance, Duncan. Don’t let the door hit you on the way out. Divestraps has been "moving" since November? Tagged with divestraps, duncan, kevlar, outstretchedhands. hands under a UV light to curer the polish. So after that and it lasted for weeks!